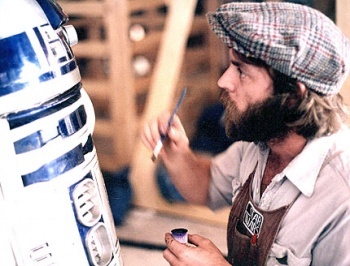 Grant McCune, visual effects artist on A New Hope and Star Trek: The Motion Picture, has died. Academy Award-winning visual effects artist Grant McCune has succumbed to complications from cancer at age 67. McCune worked on over 100 films, many of which were sci-fi classics such as Star Wars: Episode IV -- A New Hope (in which, Deadline notes, "in addition to his work as chief modelmaker for the groundbreaking film, he also appeared as a Death Star Gunner") and Star Trek: The Motion Picture. McCune specialized in models and miniatures, and worked on Caddyshack, Firefox, Spaceballs, My Stepmother is an Alien, Ghostbusters II, Speed, Batman Forever, Thirteen Days, and Rambo. He also founded his own company, Grant McCune Design, where he worked as miniature supervisor. McCune and team won an Oscar in 1978 for their work on Star Wars, beating out the visual effects team from Close Encounters of the Third Kind. He was also nominated in 1980 for his work on Star Trek.